In today’s modern work world, employee demand for continuous professional development is getting stronger. IT is a key solution to solving the employee engagement epidemic. In this week’s exclusive editorial, we discuss the CIO’s role in driving employee engagement. 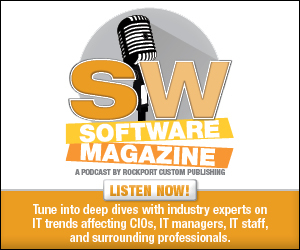 Editorial Mission: Softwaremag.com, the IT Software Journal, is focused on pointing the CIOs, IT managers, IT staff, and surrounding professionals to the product and service options available to help them address their business challenges. We do this through the Software 500 revenue-based ranking of the leading software and service providers worldwide, and through our editorial features, columns, and new product coverage, and associated Buyers Guides, across our editorial focus areas. Copyright 2018 Software Magazine. All rights reserved.